Vinnie the Pooh! : Pooh, older n wierder! 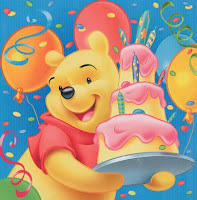 As birthday wishes came flying by, while the pooh was happily lazing away in her 100-acre forest, life did a somersault or two, but the pooh is not quite sure and wondering whether she’s moving in circles. Whether the so-called rat race is really a means to the end or to the beginning of transformation? Why all of nature is just being and being amazingly happy at that? Why the oceans never meet the skies yet love each other and live in perfect harmony? Why the salty sea breezes that were so much fun in childhood, now become a threat to my skin and hair – my outward mask? Why the eagles fly so high when their prey is anyways miles down? Why some flowers are in love with the sun and simply refuse to open their petals on sundown? Why is every creature so happy in Mother Earth’s lap and what went wrong with us? Why the heck am I asking these questions when answers are again puny in the vast open secrets of Nature? P.S: It is my Happy Birthday today and I am back from a wonderful vacation, hopefully to a more fulfilling existence. Innocence lost its charm and blogging has somehow taken its place to pen down weird streams of thoughts but there is hope. These weird streams of thoughts will not be so frequent anymore since the pooh has found something weirder elsewhere! happy birthday vinaya... have a great life.. Happy birthday. Wishing you many more blog posts this year. :) God bless. thanks man! u too april baby...cool! i missed ur posts.. my reader was not getting updated with ur feeds. i changed it now, hopefully it shud work now! the fact that you were able to make another trip around the sun. we let out a joyful sound and sing that stupid song. Happy Birthday, now your one year older. Happy Birthday, you did not accomplish much. But you didn't die this year i guess that's good enough. your chance of finding fame and wealth decrease with every year. and hoping that some day, perhaps, your life will hold some cheer. for all eternity inside a block of ice. and though it hasen't ended yet some times you wish it MIGHT! Happy Birthday, you wish you had more money. Happy Birthday, your lifes so sad it's funny. Happy Birthday, how much more can you take? But your friends are hungry so just cut the stupid cake. Starts with a G.. G.. Blah! Blah! Blah!" as for the post.. OHT !! vodka effect ?? and dont say I didnt try to read or understand it.. coz I did!! I have nothing better to do right now !! wish you many happy birthdays!!! thanks n hopefully it will continue working! thanks da...for ur wonderful poems n rhymes..cute they r..thanks again! btw, how do u know i smell like a monkey ?? d-day !!! OHT as usual..samajthe tho ho sab barabar se, lekin na samajne ka bahana karthe rehthe ho:):) u too will ask the same questions after observing nature in ur honeymoon holidays !!!! Belated greetings on your birth anniversary. Trust you had an awesome day to top your vacation. Thank you for stopping by. I really appreciate your time and hope to see you more often. hope it's not too late.. was jus going through your old posts..